The city of La Paz (3.600 Mts. above sea level) with population 2.939.874 the city most important touristic center of Bolivia: from here you can easily reach several ecological strata: the high plateau, the Royal Range (over 6.000 Mts. above sea level) and tropical sites only 2 hours from the city. The Chacaltaya Ski Resort (5.350 Mts. above sea level) � the highest in the world from which you can see all the Royal Range and lake Titikaka. The Salt flat of Uyuni (3.800 Mts. above sea level), 10.000 km. sq., is the largest lithium reserve on our planet. The Regions of Sud Lipez, with it is views of the western volcanic range, salty lagoons populated by flamengoes, and the unusual Colorada and Verde Lagoons. Ascent of Vc. Ojos del Salado the highest volcano in the world (6.893 Mts. above sea level), situated in northern third regions of Chile. DAY 01:Arrival to International airport (4.000 Mts. above sea level), transfer airport-hotel. DAY 02:City tour; visit to the museums, governments buildings, the museums street, the Andean and with market, residential zones and the unusual Moon valley, Night in hotel. 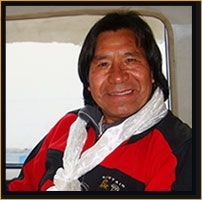 DAY 03:A 3 � hours journey to village of Copacabana by exclusive vehicle transport; lunch and the visit the surroundings areas: Intikala, Horca del Inca. Night hotel. DAY 04:Excursion to the Lake Titikaka (3.810 Mts. above sea level), from which there are marvellous views of Bolivia. After visit with motorboat Isla del Sol, Isla de la Luna, return to La Paz . Night hotel. DAY 05:Departure in the morning from La Paz to Potos� (4.1000 Mts. above sea level) Night hotel. MORNING: 09:00 am. � 11:30 am. Visit the Paillaviri mine. DAY 07:Departure in the morning from Potos� through wonderful landscapes such as oasis and impressive canyons to arrive in Uyuni village. Night hotel. DAY 08:Departure from Uyuni in the morning, cross Uyuni Salt Flat, (10.500 Km. sq.) is the largest lithium reserve in the planet. Arrival to San Juan Village. Night refuge. DAY 09:Journey to the Colorada lagoons (4.200 Mts. above sea level) stooping in Siloli desert, arrival Laguna Colorada. Night Refuge. DAY 10:Early excursions to the Sol de Ma�ana Geysers, excursion ascent to the medium volcano, arrival to the Verde lagoon (4.400 Mts. above sea level), situated at the foot of Licancabur Volcano. Night camping. DAY 11:Ascent of the Licancabur Volcano (6.000 Mts. above sea level), return to their base camp. Night camping. DAY 12:Departure from Laguna Verde, cross the Hito Cajon International Bolivia-Chile; short journey to the village of San Pedro de Atacama. In the afternoon excursion to the Moon Valley. Night hotel. DAY 13:Early in the morning, excursion to the Tatio Geysers (duration half-day), continuing and visit to the Chiu Chiu town. Arrival to Calama City. Night hotel. DAY 14:Departure from Calama, visiting the Chuquicamata mine (half-day) continue to Tocopilla, border Pacific Ocean. Stoping in rocking the sea, arrival to Antofagasta. Night hotel. DAY 15:Journey by way Panamerican pave of the Cha�aral route on to Pan de Azucar National Park on the ocean. Night camping beach. DAY 16:Travel to the city of Copiapo. Night hotel. DAY 17:Departure from Copiapo, arrival to the Murray Shelter (4.600 Mts. above sea level). Acclimatisation day and walk around Verde Lagoon at Night camping. DAY 18:Ascent to the universitario Shelter (5.000 Mts. above sea level) with assistance of 4X4 WD Land cruiser. Night camping. DAY 19:Ascent to camp site II: Cesar Tejon Shelter (5.000 Mts. above sea level). Night camping. DAY 20:Ascent to the Ojos del Salado (6.893 Mts. above sea level) to return to Universitario Shelter for the night. Night camping. DAY 21:Return Journey to Copiapo. Night hotel. DAY 22:Tour of Copiapo and surroundings. Night hotel. DAY 23:Transfer T-OUT hotel airport to board your flight and of our services.